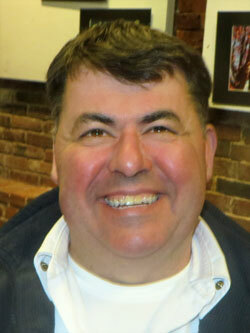 President John briefed the Club on the March Madness Raffle ticket sales. We are currently at 86 sales and need 131 to break even. Kathy has set up three sale periods at both Vista Foods and Bank of NH. Help is needed to man a sales table at the Bank of NH on Friday, March 6 from 2 PM – 5 PM. Contact Kathy for further details and to sign up. John reminded the Club that our next regular Club meeting is Monday, March 9th, as guests of the Key Club at the Laconia High School Huot Center cafeteria. Bill Gile reported there will be a fund-raiser at Laconia High School on Friday, March 20th, with proceeds to be shared by Stand-Up Laconia and the Key Club. The event will be a dance-a-thon that goes from 1:30 PM to 5 AM. Chaperones are needed. Please contact Bill Gile if you can help the Key Club with this event. Kathy Calvin reported that there are two K.A.R.E.S. events coming up, Monday, March 2nd at Pleasant Street School at 9 AM, and Friday, March 6th at Woodland Heights School from 1 PM – 2:30. Help is needed for the Friday event. $3 from John Walker: $1 for those who came out on a brutally cold night being here, $1 for his upcoming 11 week road trip, and $1 for receiving a Fire Department patch from Chief Erickson which will be gifted to a special Kiwanian in our District. 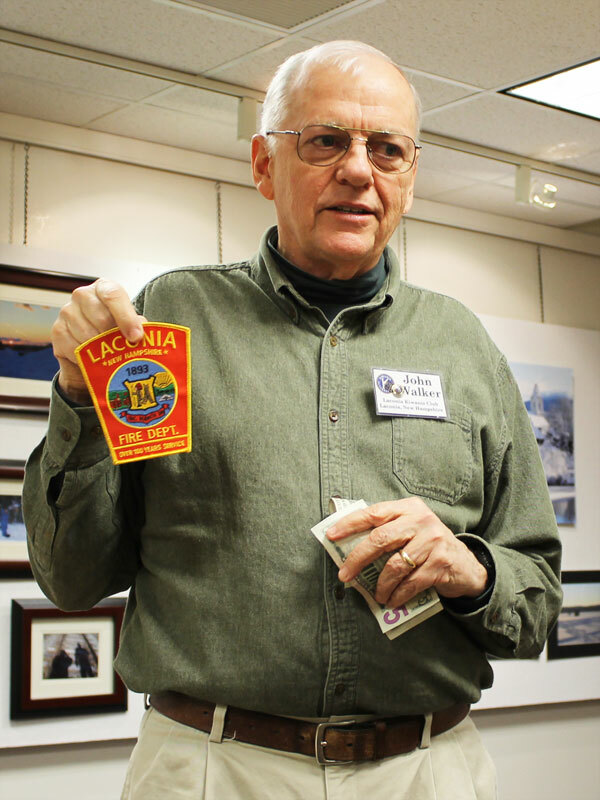 John Walker shows the patch donated by Ken Erickson that will be given to a special Kiwanian. Steve Loughlin introduced our guest speaker, Laconia Fire Chief Ken Erickson. 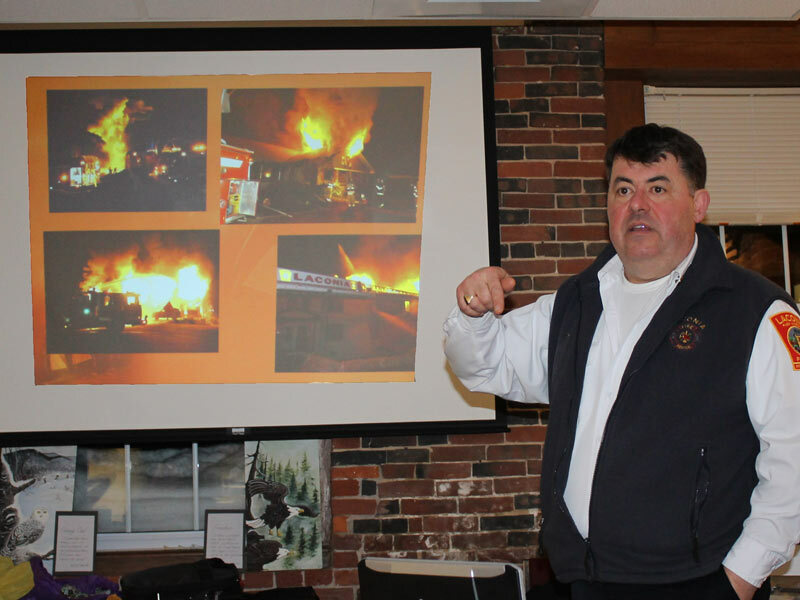 Ken, who previously spoke to the Kiwanis Club in 2004 and 2011, has been a firefighter for 36 years and Chief of the Laconia Fire Department since November 2001. Chief Erickson gave a fascinating presentation on his Fire Department complete with statistics, pictures, and data. 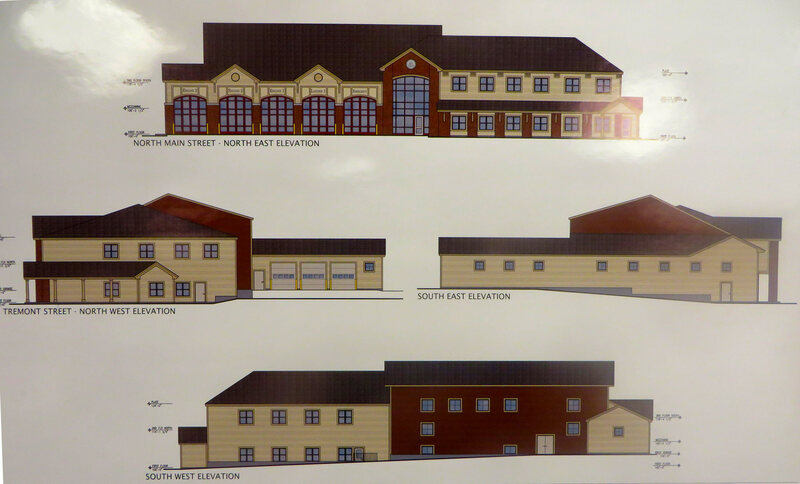 This included a brief overview of the new $4.3 million department expansion. 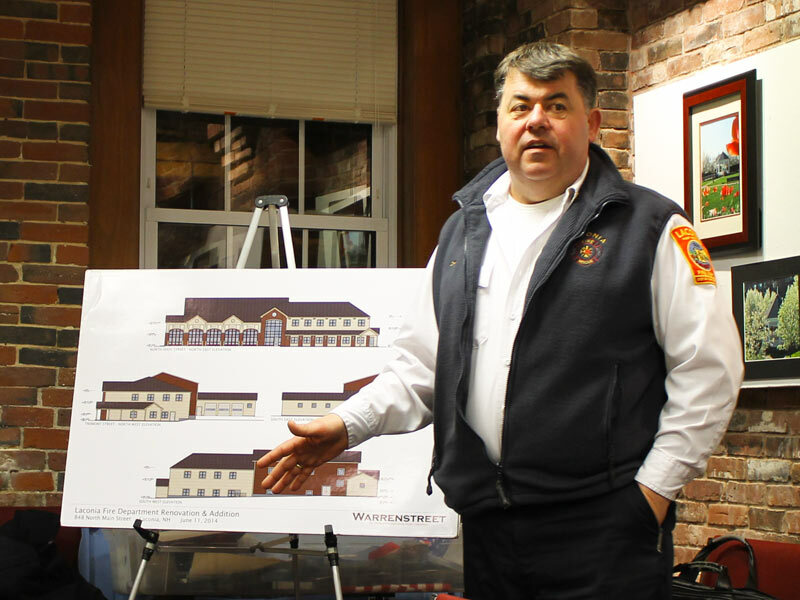 Chief Ken Erickson discusses the new fire station which is now under construction. For a close-up rendering of the new station, "click" here. •	EMS has a 48% survival rate among cardiac calls while the state average is below 10%. Chief Erickson discusses major fires in the city. At the conclusion of his presentation, Chief Erickson fielded several questions. This included a question regarding the possibility of some of his employees competing in this summer’s Kiwanis Home Run Derby. Chief Erickson welcomed the idea. Steve Loughlin congratulates Ken Erickson for his informative presentation. 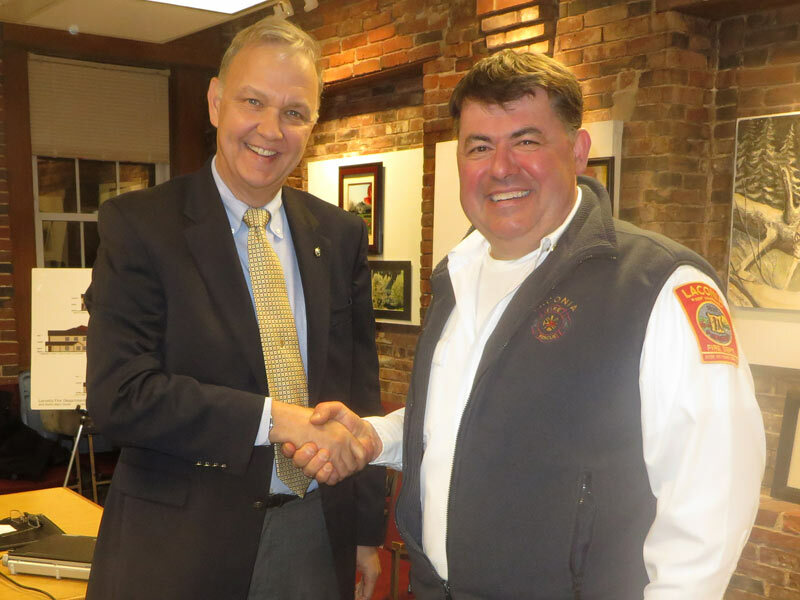 Tonight's meeting was adjourned at 8:11 p.m.
Steve Loughlin had the occasion of speaking with Roger Landry earlier in the week. 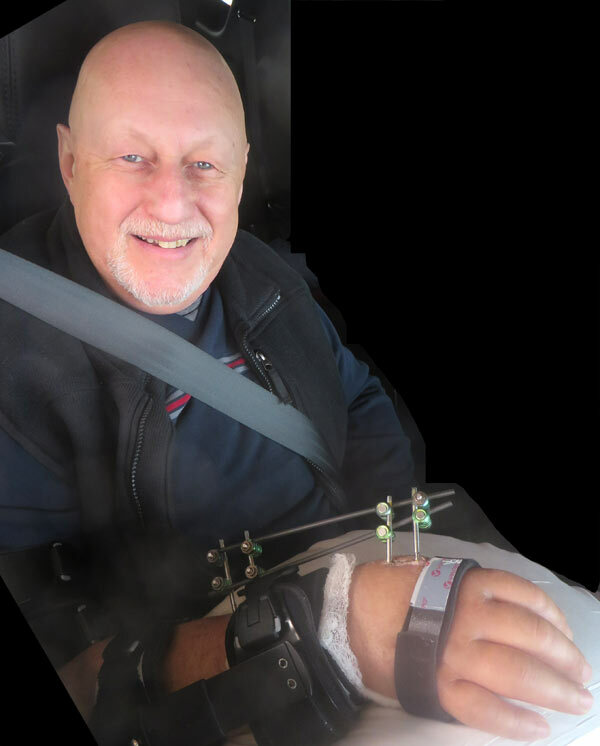 The bad news is: Roger was severely injured in a snow mobile accident several weeks ago. At that time, he broke his wrist in 30 places, broke his arm and injured his hip. The good news is: Roger is on the mend and in very good spirits. We hope to see him at one of our March meetings. Nuts bolts and a brace keep this guy together. 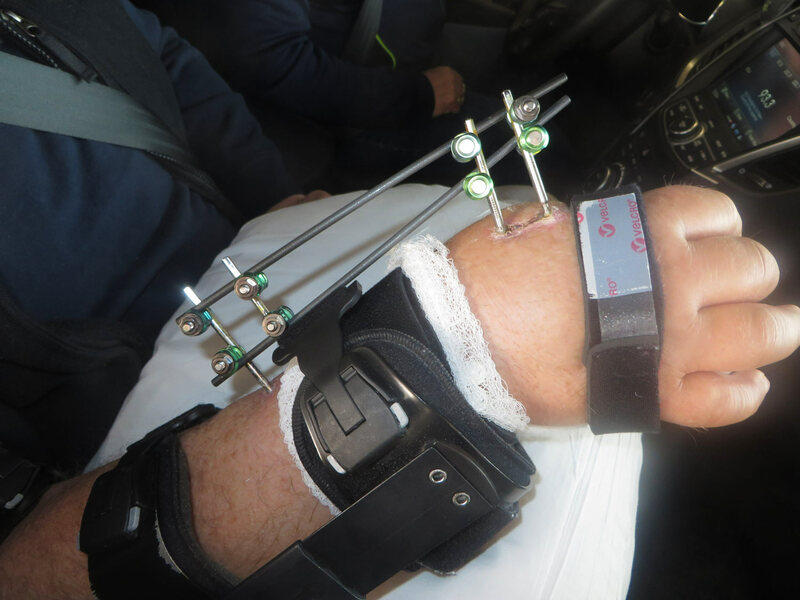 For a close-up of Roger’s wrist read on. Caution the next picture may be too graphic for those who are squeamish.